The mayor is joining more than 180,000 people currently taking part in Code Year, a campaign to encourage more people to program. "My New Year's resolution is to learn to code with Codecademy in 2012!" he wrote on Twitter. Participants in the course receive an interactive lesson each week, via email. The campaign promises that participants will be "building apps and websites before you know it". It has proved a hit on Twitter with thousands using the hashtag "#codeyear". Some of those tweeting about the news wondered if London's Mayor Boris Johnson would follow Mr Bloomberg's example and also learn to program. The London mayor's spokesman told the BBC: "Once again the mayor is in awe of his good friend Michael Bloomberg, and if re-elected will explore whether he can join him on that course." However, former mayor and Labour party candidate for the top job at City Hall, Ken Livingstone, argued that his time would be fully occupied dealing with the city's problems. "If I'm elected, I'll be a bit too busy to take any education courses," he told the BBC. London's mayoral elections will be held in May. 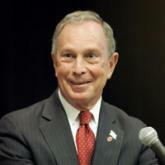 It is not clear what Mr Bloomberg hopes to do with his new computer skills, but his decision to learn comes at a time of renewed interest in encouraging people to program. In October, the Next Gen report into the teaching of computing in UK schools was published. Co-author Alex Hope told the BBC that coding should be "the new Latin". Codecademy, the start-up behind Code Year, was launched in August of last year in response to the company founders' "frustrations" with learning how to program. More than six million lessons were completed within the first month of the site going live. Mashable quoted co-founder Zach Sims as saying Mr Bloomberg's decision was "awesome".